It’s not a book about zombies. You read, “a girl rises from her grave,” and think, oh yeah zombie book, but no. Shallow Graves is not a zombie book. I didn’t expect that it would be about zombies, but I know plenty of people will think it is (they’ll either be disappointed or absolutely relieved to learn this). Throw that zombie thought out the window! What you get in Shallow Graves is a mysterious lore of different types of monsters roaming the Earth. It’s not a vengeance tale either. Breezy Lin doesn’t set out to get revenge of the one who killed her, or the people she encounters who killed others. It’s nothing like that. I read Shallow Graves as a coming to age story of a young woman who’s learning to be undead and live in this unnatural new world. Breezy Lin and her newfound powers is a force you don’t want to meet (especially if you’ve killed someone). Breezy Lin is a dangerous one. Breezy, missing and presumed dead, rises from the grave her killer puts her in. When she awakes, she has these newfound powers that allows her to sense when a killer’s nearby. She doesn’t know how she got these powers, and readers follow her as she travels across the country, trying to figure out what the hell she is and what happened. What you find in Breezy is a young woman who’s been through hell and back, so to speak. She’s angry and longing for her life that was taken from her. She’s confused about what she is and what she can do (rightfully so). She continues to forge forward into this new world she’s risen back into by relying on people who may not be entirely good, and despite the craziness and the confusing new world she now lives in, she manages to stay level-headed and tough. I quite admire Breezy for staying so sane and sort-of in control during her entire ordeal. Shallow Graves will send shivers down your spine. There’s something so lonely about this world. Shallow Graves isn’t overly creepy. 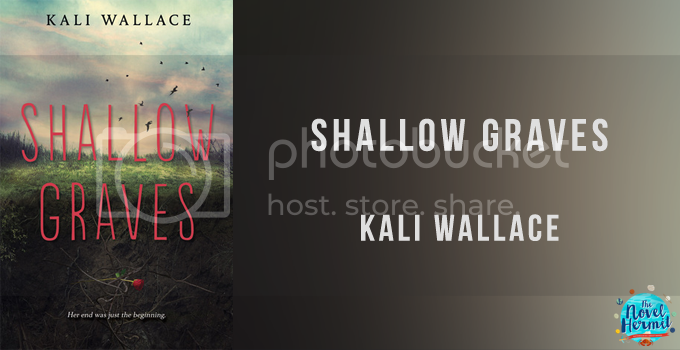 It has horror elements that Kali Wallace weaves beautifully into the story that I didn’t feel like I was on the verge of hiding under my covers from all the ominous atmosphere and the monsters (this’s a good thing!). It’s the type that creeps slowly through your body, as if it knows something terrible will happen. You’re just anticipating, and the tension sends you onto the edge of your seat. Monsters and magic exist here! You learn so many things about this world like monsters (unnatural creatures like Breezy and some of the people she encounters) and magic exist! And there’s an evangelical cult trying to get rid of them! So many intriguing things! This was a pleasant surprise! I wasn’t expecting where this book went, and I’m glad I had no expectations prior (though now, I am left with a lot of questions about this strange new world). I loved the discussions about what it means to be a monster—does that make you not a human even if you have very “human” thoughts (whatever they might be)? I won’t speak more about this because I want you to experience it. Let’s hope where it goes surprises you too! Shallow Graves have excellent writing that does a wonderful job of putting you into Breezy’s head. Kali Wallace’s writing is just so atmospheric and wonderful! She knows how to present the loneliness and the quiet anger in Breezy you will read through her writing. She has done a great job of exploring Breezy. I am just so impressed because the writing is genuine and has a loveliness to it that is almost poetic. This is what I love to read. It doesn’t exactly answer all the burning questions you may have. By the end, what you hoped to find about Breezy and this world just doesn’t happened. You’re still left with a lot of questions—about Breezy, this world, and magic—unanswered. It doesn’t feel like a standalone; it feels like it’s just getting started. I don’t need everything to explain in this book, but I expected a few important questions to be delved into like how Breezy became undead and a little about the history of this world with monsters and magic. So many things could’ve been explored in this book, but it’s not, which is quite disappointing. Do I recommend Shallow Graves? Despite the issues of the myths and storyline being flushed out, the writing is superb. You should read it just to get a taste of Kali Wallace’s writing because she will have you sucked into this horror-esque + magical realism tale about monsters, murder, revenge and so much more. I haven’t heard of this one before but reading the synopsis you do wonder if she’s a zombie or a ghoul. Glad to know that’s not the case. Not that that’s bad or anything but it makes the story more intriguing.